With Father’s Day less than a week away, we thought we’d publish an extract from Patrick Neate’s essay that appeared in our very first issue. Amongst other things, Patrick reflects on the father-son relationship he had with his cricket-mad dad. 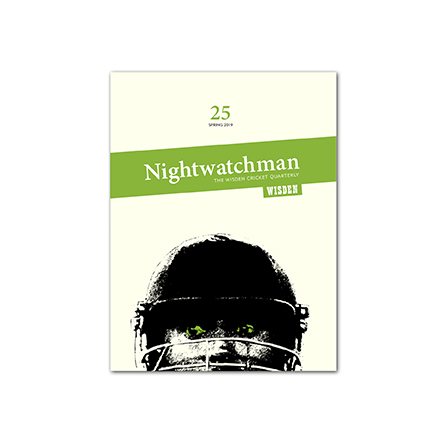 Stuck for a Father’s Day gift for your cricket-mad dad? You can buy the 2017 Collection (issues 17-20) for the special price of £36.95 including p&p . For other Father’s Day gift ideas, click here. The script is an adaptation of one of my own novels, ‘City Of Tiny Lights’, a gumshoe I once believed would presage a whole new genre of suburban thriller. I even had a name for it: Chiswick Noir. Good, eh? Almost a decade later, my novel remains, so far as I know, its only exemplar. The protagonist of ‘City Of Tiny Lights’ is a Ugandan Indian private eye called Tommy Akhtar. He’s a hard-drinking, hard-smoking hard man with a fine line in repartee. Tommy and I have little in common but cricket-mad fathers. That opening line is borrowed directly from mine. Dad was a much better sportsman than I ever was (funny, I originally completed that sentence as ‘than I’ll ever be’ but, in my forties, perhaps it’s finally time to concede defeat). He played first-class cricket for Oxford alongside the rare talent of Abbas Ali Baig and under the captaincy of the great ‘Tiger’ Pataudi, once taking 78 off a touring Australian attack that included the likes of Garth McKenzie and Richie Benaud. He went on to captain Berkshire and play good club cricket for Richmond for many years. In, I think, 1987, we played side by side in a scratch team that he organised. Chasing around 250, I opened and was out to the first ball of the innings. Our batting soon collapsed and I remember Dad walking out at number seven or eight, saying: “I’ll just have to do it myself.” And he did; returning a couple of hours later with an unbeaten hundred to his name. Afterwards, in the bar, he enjoyed his moment in the evening sun and we stayed much later than he’d planned. He then had to drive me to Taunton, you see, where my school team was playing the next day. We arrived not much before midnight and then he turned straight round and drove all the way back to London. On the way to Somerset, he’d told me (in no little detail) how to score a century and, the next afternoon, I duly did, the first of my cricketing life (which makes it sound like many followed. Let’s leave it like that). I was sorry he was not there to see my innings, but I rang him from a payphone in the evening and he listened while I talked through every run. I’m not sure what part of this story I find most revealing. The father-son relationship expressed through sport is a complex thing. We all know the archetype of the competitive dad who loves humiliating his boy at everything from three-and-in to Connect 4. It’s not quite equivalent to pinning the kid’s feet together and abandoning him on a mountainside, but surely every father of sons has a touch of Laius about him. My old man was certainly no more competitive than most and would never have enjoyed my humiliation, but he never let me win either. A couple of years later, I was captain of my school First XI. We were an average team led by an average captain, struggling for form. I had never been an expansive batsman, the strongest part of my game a kind of bloody-minded obduracy; but by the time I was 18 I’d stopped moving my feet altogether and just poked at the ball like a tramp at a rubbish bin. I’d turned into some kind of cricketing mollusc: I want to say a schoolboy Chris Tavaré, but I think Jimmy Anderson (the batsman) would be a better comparison. If any captain had set a field with nine arranged in an arc from first slip to point, I’d have never scored a run. The climax to our season was always the match against the MCC and that year Dad was their captain. They took first knock and racked up a bucket-load of runs. I left the first delivery and played down the wrong line to the second. To the third, I launched myself up the wicket and swung my bat with, the mythology tells me, ‘all my might’ – Oedipus the King! The King! You can learn everything you need to know about life from cricket and when Dad and I now watch we agree on much – for example, that Kevin Pietersen is a genius for our times (i.e. he has made a virtue of stupidity), and that, while Ian Bell must never be asked to bat for our lives, there’d be no better man to arrange flowers prettily at the funeral should Steve Waugh be dismissed. However, Dad’s assertion that cricket is ‘character building’ is, if not wrong, certainly meaningless. Isn’t everything character building? Sitting in a pub, drinking your life away; sitting in a garret, writing your life away; sitting in an armchair, spectating your life away – they’re all as character building as each other. Of course what Dad meant is that cricket builds good character. But I’m not sure there’s much evidence for that either. Dad will often say of an acquaintance: “Well, he’s a cricketer. Must be all right.” But I assume he’s joking because, while I’ve made many friends through cricket, I’ve met my fair share of tossers too. For Father’s Day gift ideas, click here.